Is there a sock hop in your future?. 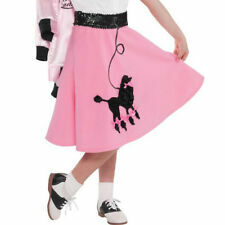 or just a 50s-style pink Poodle skirt, like this knee-length Poodle skirt with attached fuzzy pooch and black leash?. the sequined leash draws the eye to your Poodle appliqué and links into a gleaming beaded belt. Child's Fabulous '50s Pink Poodle Skirt by AMSCAN Costume NEW One Size Fits Most Is there a sock hop in your future? Or just a 50s-style Pink Poodle Skirt, like this knee-length poodle skirt with attached fuzzy pooch and black leash? The sequined leash draws the eye to your poodle appliqué and links into a gleaming beaded belt. Features: Features a full cut with attached fuzzy poodle and a glimmering silver leash that wraps around the elastic waistband. Measures 21 3/4in in length and a 14in waist opening. A strong pink and white elastic waistband keeps the skirt comfortable and snug. Attributes: Length: 16.7"Width: 11"Height: 0.7"Color: Pink.